BitInstant, the international bitcoin payment processor for exchanges and merchants, has temporarily closed shop for maintenance. The usual market interface has been replaced with a statement explaining the reasons for this move. The company says that everyone it has is working on the changes to the service and that customer support staff are on hand to answer queries about current transactions that have been place. As many of you know, we recently re-launched our website. During this process we introduced many new features and changes to the way customers interact with our services. This process has been a learning experience, and you’ve provided a lot of great feedback on how things work and how they could work better. We value this input and the insights that it’s led us to and we want to ensure that as we work, you, our customers, don’t feel the growing pains associated with these improvements. For this reason, we’ve decided that the best way to proceed is to close shop and dedicate the entire team’s efforts to creating the next generation of BitInstant. 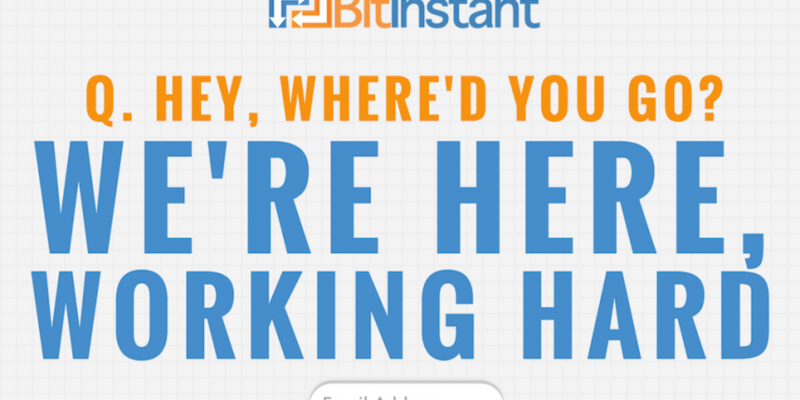 Customers who need to discuss an ongoing issues are invited to email the customer service department at support@bitinstant.com, but the company asks that people restrict contact to only support queries and not to make general queries. We have reached out to BitInstant for comment and will update this story as and when we know more. If you’re affected by this story, tell us about it in the comments or on Twitter.